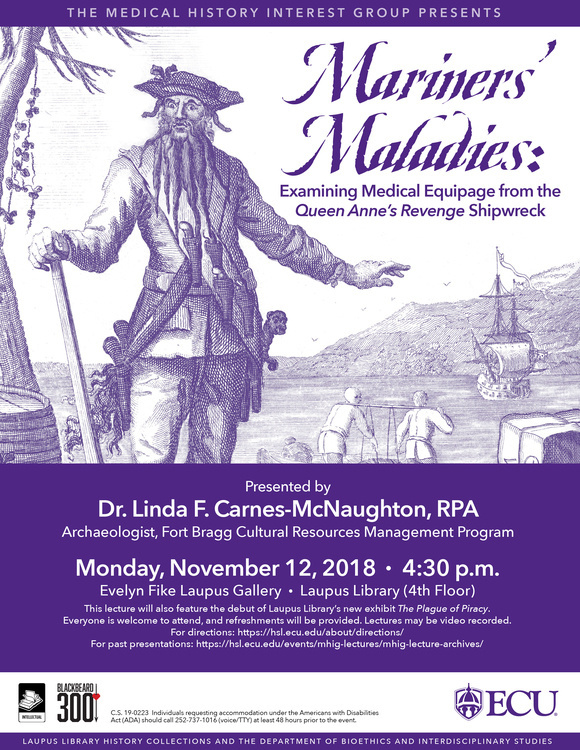 The Medical History Interest Group invites you to attend "Mariners' Maladies: Examining Medical Equipage from the Queen Anne's Revenge Shipwreck" presented by Dr. Linda F. Carnes-McNaughton, RPA; Archaeologist, Fort Bragg CRMP Co-Author, Blackbeard's Sunken Prize (UNC Press 2018). Shipboard medicine during the 17th and early 18th century's Golden Age of Piracy was challenging. Chronic and periodic illnesses, wounds, amputations, toothaches, burns, and other maladies of the crew, captain, and enslaved cargo had to be treated. This presentation will look at evidence of the tools used to heal the sick and wounded recovered from shipwreck 31CR314, identified as Queen Anne's Revenge (formerly La Concorde, a French slaver). Dr. Linda F. Carnes-McNaughton, RPA, Archaeologist, Fort Bragg CRMP, has been a volunteer professional on the QAR Shipwreck Project since 2006. In 2016 she published "Mariners' Maladies: Examining Medical Equipage from the Queen Anne's Revenge Shipwreck" in Vol. 65 of the North Carolina Journal of Archaeology. With Mark Wilde-Ramsing, she wrote "Blackbeard's Queen Anne's Revenge and Its French Connections" in Pieces of Eight: More Archaeology of Piracy, published in 2016 by the Univ. of Florida Press and also Blackbeard's Sunken Prize: The 300-year Voyage of Queen Anne's Revenge, published in 2018 by the UNC Press. This lecture will also feature the debut of Laupus Library’s new exhibit The Plague of Piracy. The exhibit includes several replicas of medical artifacts found at the Queen Anne’s Revenge wreck site. For directions, click here. For parking information, click here.